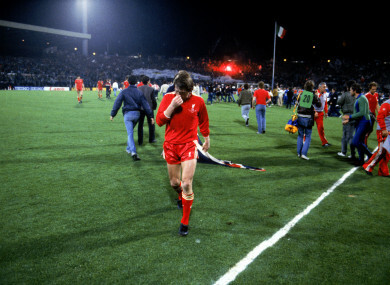 Liverpool's Kenny Dalglish walks off the pitch after his team's 1-0 defeat. THE FOLLOWING PASSAGE is an extract from Two Tribes: Liverpool, Everton and a City on the Brink by Tony Evans. Liverpool had lost a football match. The players were numb and bewildered as they sat on the coach taking them away from Heysel Stadium. There was usually silence on the journey home after a defeat but this was a different sort of hush. People had been killed on the terraces before the game. added to the confusion. Then the Brussels chief of police told the players that people had been killed. They needed to play to prevent an escalation of the trouble. Juventus, they were told, had agreed to participate. Some of the team did not want to go out and perform in these circumstances. Even their half-hearted involvement would haunt and embarrass some of them for years. Afterwards, the mood was not that of a defeated team. It was the shell-shocked gloom of a group of men who had been unwilling extras in a tragedy. A charge by their supporters had caused panic in a supposedly neutral section that was predominantly filled by Juventus fans. As the crowd backed away, the brickwork disintegrated and hundreds of people were rushed. The death toll would reach 39. Mark Lawrenson was not with his teammates. The centre half started the match but his fitness was always in doubt. He had dislocated his shoulder two weeks earlier and only played because this important match was the last of the season. Within three minutes, he aggravated the injury and was rushed to hospital. Lawrenson was taken to hospital along with the dead and dying. He awoke after an operation to find the corridors full of angry Italians and an armed policeman protecting his bed. ‘When I was leaving the next day with Roy Evans, people were spitting and shouting at us,’ he said. Bruce Grobbelaar, the goalkeeper, considered giving up his career. Michel Platini, who scored the winning penalty for Juventus, went on to be president of Uefa. The Frenchman joined his teammates on the lap of honour after the game and celebrated gleefully with the trophy. Asked whether they would have pranced about had they won, the Liverpool players who were there that night invariably respond with a grimace and a shake of the head. News that Joe Fagan was retiring as manager had broken on the morning of the game. He was to be replaced by Dalglish, the team’s best player. The 34-year-old found himself in charge of a club with its reputation in tatters. The ramifications of the dreadful night of 29 May in Brussels would extend much further than football. The credibility of an entire nation was on the line. Liverpool and the club’s fans were the focus of the initial contempt and anger in the immediate aftermath of Heysel, but soon the whole of English football would have to share the guilt and punishment. The knee-jerk response by the Conservative government was to act in a draconian manner before they had even begun to explore the causes of the disaster. Under pressure from Prime Minister Margaret Thatcher, the FA withdrew English clubs from European competition within 48 hours of the game’s finish. Thatcher reacted to the disaster immediately. The day after Heysel, she summoned football journalists who had been at the game to 10 Downing Street to get their views about what was wrong with the sport. Peter Jones from the BBC, the Daily Mail’s Jeff Powell, Charlie Burgess of the Guardian, the Express’s Merseyside man John Keith, Mike Ellis from the Sun, the Press Association’s Peter Went and the Sunday Times’s Brian Glanville are mentioned in Cabinet papers as attending the slightly surreal summit. Glanville remembers cycling from his home in Holland Park to Whitehall in a pair of football shorts. At Downing Street, he was told by police to park his bike where Quintin Hogg, the Lord Chancellor, used to leave his bicycle. He then quickly changed into trousers, a jacket and an Old Carthusian tie. He might have looked like another old-school Tory but appearances were misleading. Glanville may have been a former public schoolboy but his views were certainly not those of the Establishment. ‘It was a strange experience,’ he said. ‘Mrs Thatcher talked about getting “ordinary, decent fans” to stop any trouble. I imagined a grandfather saying to a young hooligan “Stop kicking him” and decided she had no idea about the reality of the situation. ‘I told her that the troublemakers felt alienated. Glanville is a fine impressionist. He quotes Thatcher in the patronising, schoolmistress manner that she adopted when talking down to those who did not agree with her stance. The Prime Minister was reluctant to accept that the troubled economic situation had any impact on hooliganism but, as the Cabinet papers show, the seven journalists made sure they hammered home the point. The notes of the meeting make their views unambiguous, clearly stating that it was ‘a social phenomenon rather than a football phenomenon’. Two Tribes: Liverpool, Everton and a City on the Brink by Tony Evans is published by Bantam Press. More info here. Email “‘We didn’t want to play... We weren’t really given a choice’”. Feedback on “‘We didn’t want to play... We weren’t really given a choice’”.